The Big Sea: 10 to 40 Book Challenge! Whirlwind School Year; What a Ride! School year 2015 -2016, I was ready to throw in the towel. I was sooooo done with teaching; I was bored to death. If I was bored, can you imagine how my students were feeling?? Teaching one book at a time is boring.....I had been doing that since I started teaching, and I knew that I needed to do something differently. I began to read and read and talk to folks, and someone told me about Donalyn’s Miller book The Book Whispers. Donayln’s book helped me to “Go Back To Love.” I decide to take my love and passion for books into the classroom, AND school year 2016 -2017 was the best school year that I have EVER had. I gave up control, talked abouts books every single day, turned my students on to the power of words, gave my students complete choice in what they could read, and My, Oh My! 02. The Namesake by Jhumpa Lahiri. 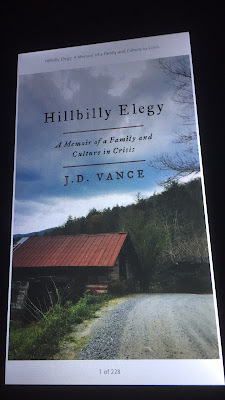 This book was recommended to me by a student. Not my favorite book; I had a strong dislike for the main character. However, my empathy grew for his story and the many different immigrants stories. 03. X by Ilyasah Shabazz and Kekla Magoon. I found this book to be boring, but it can definitely be used to introduce students to Malcolm X. 04. Drowned City by Don Brown. This was our required book for first quarter. INCREDIBLE look at Hurricane Katrina. You know, many high school students were very young when this horrific event took place. Great way to introduce them to a part of American history. 05. Interpreter of Maladies by Jhumpa Lahiri. This is a collection of short stories. Loved every one of them. I read this book, because a student said that I MUST. 06. Song of Solomon by Toni Morrison. This is the one book that I read once a year, and I teach it with my whole heart. It is the blueprint for my entire AP class. 07. The Reading Zone by Nancie Atwell. If you want to know more about taking love back into your classroom, read this book. 08. Draw the Circle by Mark Batterson. If you are believing God for ANYTHING. This is the book for you. 09. Write Beside Them by Penny Kittle. Good book about how to introduce writing into your classroom. 10. The New Jim Crow by Michelle Alexander. Life altering book. My people, we got to take a closer look at our justice system and work to reform it. MUST READ FOR EVERYBODY!!!! 11. Stitches by David Small. This is an adult graphic novel that I thoroughly enjoyed. Young adults would enjoy it. However, because of the content, you may want to read it first. 13. All the Light We Cannot See by Anthony Doerr. INCREDIBLE.... Read this book and grow. 14. As Brave As You by Jason Reynolds. The most loving book that shows the love between Black men and boys. 15. Life is Short But Wide by J. California Cooper. This was a reread, and it is all about love. J. California Cooper can WRITE. THAT IS ALL!!! 16. Everyday by David Levithan. I was not fond of this book. But, teenagers love this book for some reason. 17. The Power of Now by Eckhardt Tolle. One of the Best Books Ever. I have read it so many times over the past twenty years. Right now is all we have... Be Present In It. 18. The Boy in the Black Suit by Jason Reynolds. I love the way that Jason Reynolds treats delicate situations. Great book about coping. 19. The Five Love Languages by Gary Chapman. You need to know your love language. 20. The Five Love Languages: Singles Edition by Gary Chapman. I repeat. YOU NEED TO KNOW YOUR LOVE LANGUAGE. 21. Bud, Not Buddy by Christopher Paul Curtis. The most delightful book. I heard that 5th graders read this book. It’s so delightful, I think that almost anyone can appreciate this book at any age. 22. Pushout by Monique W. Morris. If you work with Black girls. READ THIS BOOK! 23. Despite the Best Intentions by Amanda E. Lewis and John. B. Diamonds. If you want to understand how systematic racism plays out in schools, this is the book for you. 24. We Should All Be Feminist by Chimamanda Ngozi Adichie. I read this as the Women’s march was approaching. Thought provoking and a quick read. 25. Another Brooklyn by Jacqueline Woodson. Incredible book about the complexity of women's relationships. 26. Think and Grow Rich: A Black Choice by Dennis Kimbro and Napoleon Hill. GAME CHANGER. It needs to be read and read and reread. 27. Garvey’s Choice by Nikki Grimes. This book evoked so many emotions in me. I will share it with as many students as possible. 28. Swing Time by Zadie Smith. Incredible, Incredible. Life is complex y’all. 29. Tell Me How Long the Train’s Been Gone by James Baldwin. James Baldwin just gets it right. This book reads like it could have been written now, but it wasn’t. 30. Ghost by Jason Reynolds. Love LOVE LOVE.... LOVE! The characters and storyline.. LOVE LOVE LOVE! 31. American Street by Ibi Zoboi. Immigrants in Detroit... Thought provoking story that I will never forget and will read over and over again. 32. "Multiplication is for White People” by Lisa Delpit. 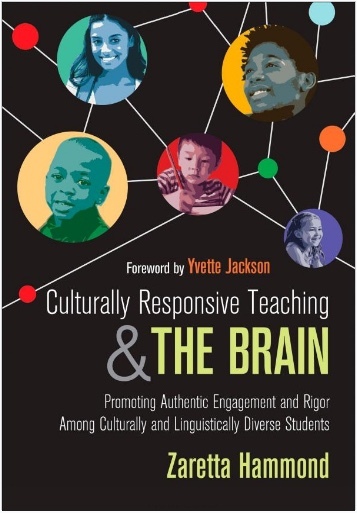 If you work with children of color, read this book. 33. When I Was The Greatest by Jason Reynolds. This book is the greatest. I had so many thoughts and feelings after reading this book. I even ran upstairs to get a student out of another class to talk about this book. 34. The Hate U Give by Angie Thomas. This book came out of the Black Lives Matter Movement. I was not feeling this book; I like more character development. However, I had some students to really like it. 35. Black Like Me by John Howard Griffin. A close look at how folks just simply don’t like Black people because of their skin. That is all... OUR SKIN. 36. The Pearl That Broke Its Shell by Nadia Hashimi. All that I can say is incredible. 37. Caucasia by Danzy Senna. There is nothing not to like about this book. 38. The Coming by Daniel Black. The most beautiful slavery narrative ever told. 39. This is how you Lose Her by Junot Diaz. This is an incredible collection of short stories....Add this to your diversity list. Junot Diaz is a Dominican, American writer. 40. A Shepherd Looks at Psalms by W. Phillip Keller. This book showed up at the right time. It was my book club’s selection. 41. Hallelujah Anyway by Anne Lamont. Grace and Mercy.... Grace and Mercy... This was a great reminder of the importance of Grace and Mercy. 42. 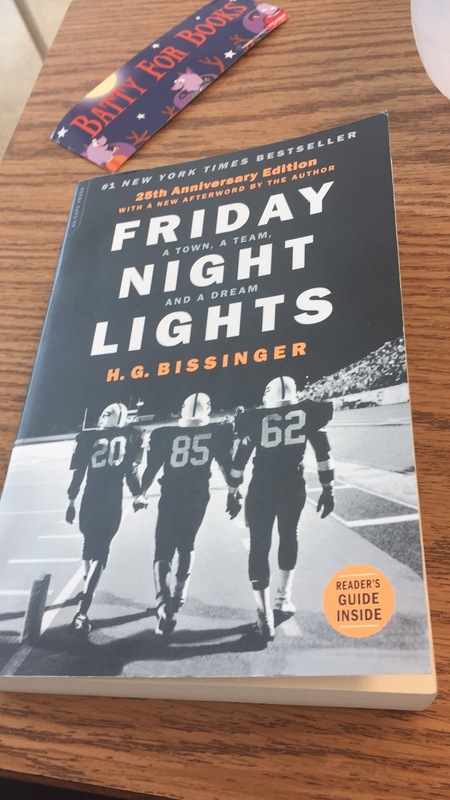 Friday Night Lights by H.G. Bissinger. 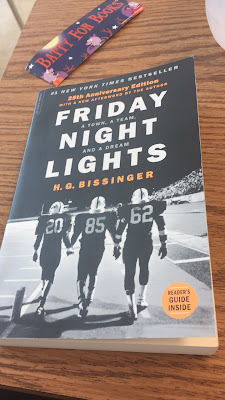 My students read and loved it, and so I gave it a try. Very informative and engaging... Must Read. 43. Culturally Responsive Teaching and The Brain by Zaretta Hammond. Every teacher MUST read this book. It gives practical strategies that can be implemented right away. 44. The Handmaid’s Tale by Margaret Atwood. I love this book more than I can say. Oh, to be a woman. 46. 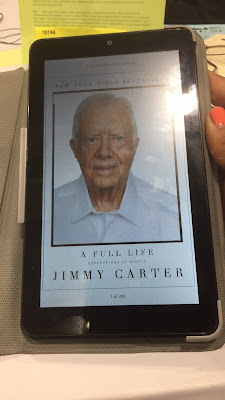 A Full Life by Jimmy Carter. Completely boring, but President Jimmy Carter is a GOOD MAN. Y’all, school has been out for almost two weeks, and I thought that I would include the one book that I have read so far during my summer break: My Grandfather Would Have Shot Me by Jennifer Teege. This is a great story of a grown woman coming of age. Yep, I think we come of age until we die. It’s funny how books evoke emotions, and just going back over this list, I was transported right back to where I was when I read each book. For all of my literature teachers reading this, you have to be a resource for your students, and just reading during the summer is not enough... You got to read, read, read.... and help students to become readers and GROW!